The Fort York neighbourhood has become a popular destination for the young, urban crowd looking for a downtown dwelling close to the action. The area benefits from close proximity to a network of transit lines and important highways. Expansive parks and the Waterfront Trail make hanging out near Lake Ontario a daily possibility, while every important entertainment venue is within walking distance. None of the city's main amenities are out of reach for those inhabiting this region. Fort York is also desirable because of its proximity to some of Toronto's most expansive office districts. Anyone working or studying downtown can easily complete their commute, in the luckiest of cases, by foot. Condo options are plentiful in Fort York, with many high-rise buildings offering an array of large, small and medium living spaces. Though young professionals comprise a large portion of the community's makeup, students and families also have a presence. Fort York’s Transit Score is 100/100, and it’s easy to see why. Located just north of Lakeshore Blvd, Fort York has quick and easy access to the Gardiner Expressway. A short stroll to the foot of Bathurst St will take you to Toronto’s downtown airport, Billy Bishop. In terms of public transit, Fort York is in the middle of both the 511 Bathurst and 510 Spadina streetcar routes, and just south of the 504 King streetcar. Travelling a bit west on the Bathurst streetcar will take you to Exhibition Station, one of Toronto’s two main GO Transit stations. All this gives residents of Fort York quick access to: TTC, GO Transit, major highways, and air travel. Who lives in Fort York? Fort York caters to the young professional demographic, and has successfully attracted many residents who fit the bill. A lot of them are renters, though Fort York also has many condo owners. The following data was obtained from the 2016 Niagara neighbourhood census profile, and the City of Toronto Ward 19 profile. Average prices are determined by the realestatecondos.ca listings. Fort York residents have easy access to a wide range of shops and groceries, from specialty places like Healthy Island Foods and Harbour Green Farms, to one-stop shops, like Loblaws. Trendy boutique shopping is all around, with King West, the Fashion District and the Entertainment District each within a short walk. The number of options between these regions is truly dizzying, and makes for a shopoholic's dream (or nightmare). Fort York is densely packed with high-rise condos, so you know there has to be some good eating options nearby to keep everyone satisfied. In the summer, this means an endless run of patios attached to a combination of local joints and big chain restaurants. Those looking to slake their thirst are equally well-served, as many of those same patios double as bars. King Street West (a few blocks north) is the centre of the community's culinary and nightlife scene, with a diverse range of restaurants and clubs ready to satiate every palette. The neighbourhood’s namesake comes from the national historic site Fort York, which was a military fort built by the British Army in the late 18th century to defend the settlements forming in Old Toronto from military attack. This national park is at your doorstep and is open to the public. The site also hosts annual musical, cultural and food festivals like Field Trip: Downtown Toronto’s Community Music & Arts Festival. Fort York is bordered by some of Toronto’s premiere entertainment destinations. Exhibition Place hosts the Canadian National Exhibition (CNE) for 18 days each August; the annual fair, now in its 140th year, effectively marks the end of the summer for the city. Exhibition Place is also a public property housing the homefield for the Toronto Football Club (MLS) and the Argos (CFL). There are also numerous commercial trade shows taking place on these grounds year-round. Next, Rogers Centre, the newly renamed Scotia Bank Arena, and Budweiser Stage are also close neighbours to Fort York. You can attend most sports or concert events in the city by heading to any of these essential Toronto venues. 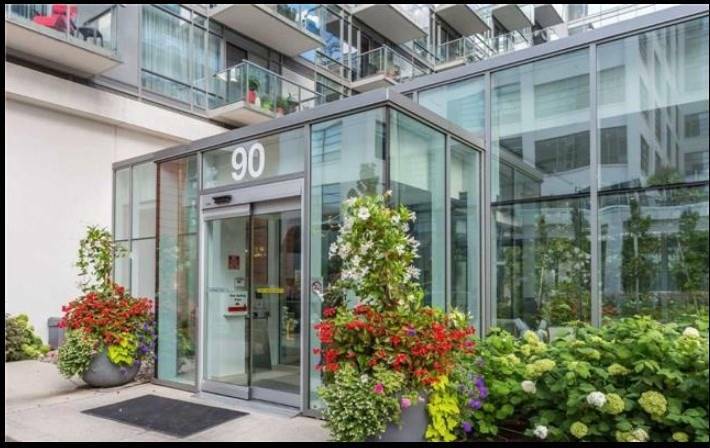 The neighbourhood is also within walking distance to the CN Tower, Harbourfront Centre and Ripley’s Aquarium. It also contains one of the newest and most state of the art public libraries in the city. Lastly, King Street West (a few blocks north) is the place to go for culinary and nightlife, with a diverse range of restaurants and clubs to satiate every palette. Fort York truly has it all. The Fort York neighbourhood has a growing number of public schools nearby, educating from kindergarten to grade eight at The Waterfront School, and an alternative high school along the Waterfront called City School. For the traditional teenager, a hop on the 511 Bathurst streetcar will get high school students to Central Technical School in around 20 minutes. A ride of about the same length, on the 510 Spadina streetcar north, will get post-secondary students to University of Toronto’s St. George campus. Oasis Alternative and Ogden Junior Public School are nearby and additional options for Fort York’s young and hopeful. CityPlace Condos are planning to open a school and community recreation centre on-site in the near future as well. If the Fort York National Park isn't enough, don’t worry; there’s an extensive network of greenspace to be explored all around the neighbourhood. To your south, you’ll find the Waterfront biking and running trail that extends along the Lakeshore and Queensway roads connecting you to the city’s numerous parks, including the Toronto Harbourfront and its gorgeous Lake Ontario views. Additionally, you can head north to Trinity Bellwoods Park, a popular area where thousands descend every spring and summer. If crowds aren’t your vibe, you can also hop on a ferry and cruise over to the Toronto Islands if you’d like to escape the city for a bit. And these are just the places nearby!